There's no avoiding it now. You're getting the evil eye from that shopworn shoebox labeled "Tax," and it's stuffed to the gills with business-expense receipts, Form 1099s and undecipherable notes to yourself. But before you dive into the nitty-gritty, force yourself to address the big question: What's the best way for the self-employed to prepare their tax returns? Let us make one thing perfectly clear: You should not face Uncle Sam armed with just a pencil, calculator and a sheaf of IRS forms. Even in this day of tax software, Web sites, preparers and CPAs all angling to complete your return, "about 50 percent of returns are prepared with pencil and paper," says Todd Stanley, product manager for Intuit's TurboTax, a leading tax-preparation software package. Without the aid of software or a professional preparer, it's just too easy to commit basic errors of arithmetic, transcription and so on. If you file a Schedule C and use tax-prep software, you probably do not need to see an accountant or other tax professional, insist the folks at TurboTax and H&R Block, which offers its own tax-prep software. 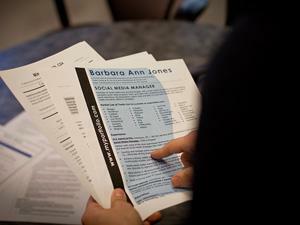 The packages lead you through a series of interviews that determine which forms need to be included in the tax return. Then, with your input, the software fills out the forms and, where required, transfers information from line to line and form to form. "Bringing deductions to your attention" is one of the chief attractions of TurboTax, says Stanley, who is based in San Diego. The Home and Business version of TurboTax leads consultants and contractors through key areas such as depreciation, Section 179 deductions, the home-office deduction, vehicle expenses, as well as IRS tests of a filer's status as an employee or independent contractor, he says. The H&R software, which comes in a basic, deluxe and premium editions, covers the same ground, according to Frank Childress, a tax developer for the product. Not surprisingly, accountants have a very different perspective on the notion of "the rest of us" preparing our own taxes. "I think that many people who are self-employed have talents unrelated to doing taxes," says Gaylord Smith, a CPA and professor of economics and management at Albion College in Albion, Michigan. "Taxes are complicated. In most cases, people are happy they received advice from an accountant." Kenn Tacchino agrees. "There's always value added by the professional, somebody who has the insights and can explain to you, for example, why an SEP IRA could be a great idea for retirement savings," says Tacchino, who has a master's degree in tax law and is an associate professor of taxation at Widener University in Chester, Pennsylvania. "These packages have gotten better over the years -- they are user-friendly," he acknowledges. But in some of the situations that contractors face, "filers have to know what they want to do," because they can't always count on the software to lead them to the optimal tax strategy, he says. OK, we've banished the software makers and the tax experts from the room; it's time to make your decision. Should you take your chances and pay about $30 for tax-preparation software, or shell out five or 10 times that much for an hour or two with an accountant? If you doubt the need to hire a CPA each year, maybe the best solution is to combine these approaches, in either of two ways. Option 1: Pay a CPA to do your taxes this year. Ask him a lot of questions throughout the process to make sure you understand the whys and wherefores. Then next year, if you feel confident about doing it yourself, go ahead and try it, using this year's return -- prepared by your accountant -- as a guide. Don't forget to factor in changes in your situation and tax law; when in doubt, run back to your accountant with your tail between your legs. Option 2: Prepare the return yourself, using one of the leading software packages. When you're finished -- or stymied -- take the return to an accountant and have it professionally reviewed. Unless you've really screwed things up, you may save some money this way. Your accountant won't love you, but the feeling is mutual, right?